We all know that knowledge is important to score points. It is therefore not surprising that a lot of ambitious players are very eager to collect databases. In an earlier mentioned youtubemovie on this blog, see chessintuition part 2 Anand tells us that today he has a database of about 20 million games. The author of the book Grandmaster repertoire 10 The Tarrasch Defense, Nikos Ntirilis assumed initially that these were all quality games but on Quality chess blog I already indicated that this can impossibly be correct. We may assume that the reigning worldchampion only will speak about quality games when one of the players is at least top 100 and if the game is played on a standard timecontrol. If we take an optimistic 100 games per year for each of the top 100 players then not considering duplications, we achieve only 10.000 games per year in total. This means we need 2000 years to collect 20 million quality games. It is clear that a worldchampion collects much more that just quality games. Of course i don't know the exact content of Anand's database but i am pretty sure that it is built around a Chessbase product (Mega or Big database) so also a lot of games with a limited quality are included. Now one can ask himself if it wouldn't be wise to throw out the less interesting games. Well I believe there is in every serious played game something interesting to learn. This I already discussed extensively in my previous blogarticle which games to analyze. We also know that databases are a good source to find information about opponents. Most worldclassplayers don't play exclusively against their peers (simuls, open tournaments,...) We should also not forget that some young players will later become much stronger players. Finally storing a big database is very cheap and we possess today about tools which permit to search through such database very fast the information in which we are interested. Hereby I also want to remark that it is better to use chessbase format as database as I experienced serious lags when using pgn format. Now even if we collect all these games with limited quality, still 20 million is an astronomical figure. The most recent commercial Mega Database counts 5,4 million games. I have around 7 million games of which I made a detailed summary in a comment under my blogarticle green moves. Recently I added thanks to a hint of hypekiller5000 another nice collection of quality games which were played between engines, see computerchess. Openingkillers you won't find but such enginedatabases are a handy tool to define in a fast and accurate way the evalution of today's existing openingsvariations. In openingmaster you can find today with paying some fee, 8,7 million games. I doubt you will find more on the internet as a standard chessplayers so Anand clearly has access to some exclusive channels. Mark Uniacke claims on the Hiarcs website that Anand uses their engine so probably also has access to additional enginedatabases. It is also generally known that Anand is close friends with Frederic Friedel and therefore likely has access to the games played on the webportal playchess. Today on the counter of playchess we see 660 million games so it must be easy to select the 10 million better games out of it by using criteria like rating and tempo. Besides a continue search for quantity, an equal search for quality happens. A few decades ago, quality was only linked to games played between worldclassplayers. Today these games are obviously still important but today most players have also discovered that iccf possess a real treasure of high quality games. In quite some recent otb-games we see the novelty originating from the correspondenceworld. Sometimes this creates weird and wild games when both players are using the same information. On chessvibes I found the game Vachier-Lagrave Gelfand in which both players followed a iccf-game from 2012. Maxime deviated on move 18 with a continuation of which I assume (considering the fact that little time was used for the whole game) he knew in advance that black with correct play could draw. Boris however had made his homework too as in lightning speed they liquidated with some fantastic tactics to a perpetual check. The example clearly shows how extensive these players prepare their openings and not only are aware about the keygames but also look critically to all sort of alternatives. Below you can replay both games. The otb-game was played in the recently finished worldcup which was won by Kramnik. I also experienced a similar case a few months ago. Contrary to the previous example this time it is less clear who was first as the story already started in 2010. 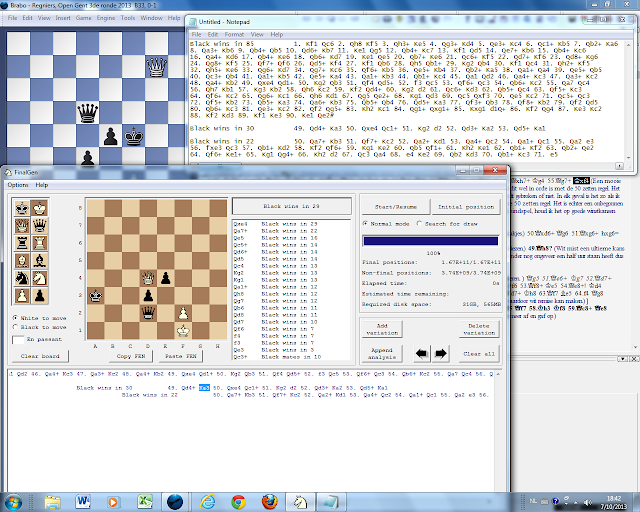 On chesspub I published my self-made analyses on the Stautongames with Qe2 on account of my game against Pieter Saligo. In 2011 a correspondencegame was played with exactly the mainline which I had recommended. Of course it can be a coincidence but as a lot of correspondence players are active on chesspub, it wouldn't surprise me that 1 or both players were aware of my earlier published analyses. On my turn I was aware about the correspondence game thanks to a website on the Stautongambit. Besides if you are an adept of gambits then you certainly should spend some time on Ian Simpson's Chess Site. Initially i only took notion of the game and it was only after Stefan Docx told me (in Open Leuven 2012?) that black in the final position also can make a draw with the spectacular Bxc3 that I did the effort to check some variations on a computer. Several months later it popped up on the board during the 6th round of Open Gent. In the hour preparation on Arno Bezemer I had only revised my original analysis of the Stautongambit with Qe2 so during the game I couldn't remember the exact moves anymore of the correspondence game. Nevertheless thanks to logic play we anyway achieved the final position and at that moment I got a déjà-vue as I saw immediately the sacrifice on c3 and its consequences. Obviously the game attracted quite some crowd, curious of what exactly happened. Only after I and Stefan Docx explained that everything was known, people withdrew quietly. Just like in my blogarticle de wetenschappelijke aanpak reactions were very diversified from astonishment to disgustment. I don't want to start up a discussion if these kind of otb-games are a good or bad thing for otb. Fact is that you as a titleholder are more or less obliged to be aware of these correspondencegames to level the opening. Iccf also started to realise that and came to the conclusion to hide their databases for non-members. Since end of last year (see ICCF Congress 2012) the database is hidden, something which I only discovered in july as I only then tried to download the most recent games as preparation for Open Gent. My tries on chesspub to circumvent these blockade didn't work so readers willing to help me, will certainly do me a favor. I expect some otb-players will still have access via exclusive channels to the iccf-database and obviously I would like to be part of that group of otb-players. 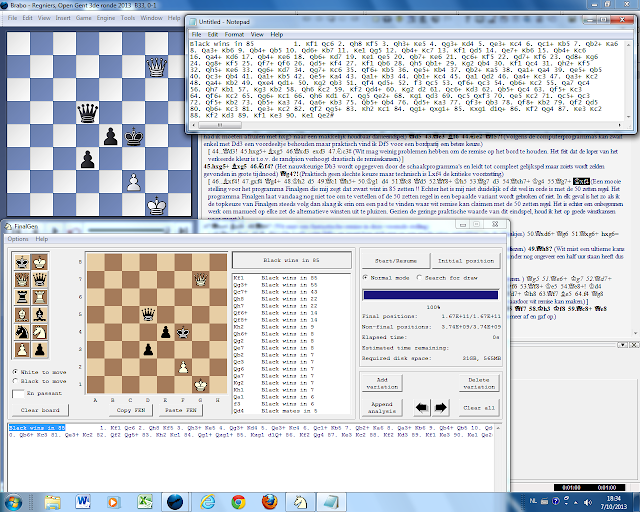 On chessvibes I already noticed that no more references are made to recent correspondencegames played in 2012. It is a sad evolution which I earlier already discussed in my blogarticle partijpublicaties. That iccf prefers to distantiate themselves from otb, was recently confirmed in an important change of their statutes. In the ICCF Congress 2013 was decided not to follow anymore the basic laws of otb so fide. Now I don't expect that iccf will change the movement of the pieces like knight or bishop but the emphasis will be much more on the correspondence so the analysis. A remarkable decision was to introduce ratings for Chess 960. Another remarkable decision is to abolish the 50 moves-rule (article 9.3) if a tablebase is reached in a correspondence game. Players can now with a tablebase claim a draw or a win at the tournamentdirector. The big advantage is that one isn't obliged anymore to wait many months for the result which everybody already knew. The disadvantage is that we can have for the same tablebase a different result for otb compared with a correspondence game. What exactly this means and why iccf has made this decision, will be explained with a position which I already touched in my blogarticle chessintuition part 2. 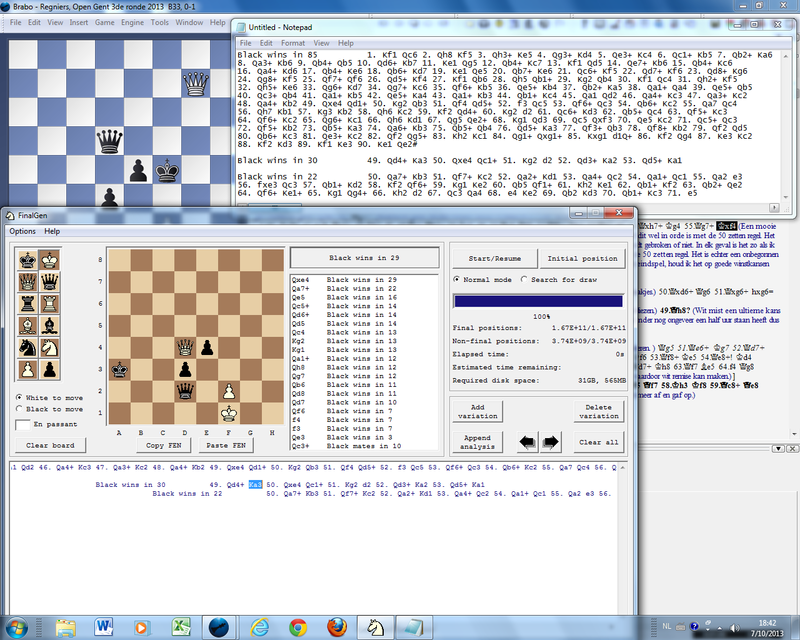 The upper screeshot shows finalgen giving the output that black wins in 85 moves. I also showed the mainline so that we see the 50 moves-rule doesn't kick in. This means if both follow the topline then black would win in otb and correspondence chess. However the story isn't finished yet. If I select on moves 49 and 50 a quicker losing move on first sight then we get another verdict. Black now wins in 48+1+22 = 72 moves but now the 50 moves-rule does kick in (only at move 55 a pawn is moved). In otb this would mean a draw but in correspondence with the new rules, black can still claim the win. The inverse we can now do for black. We search for a less quicker win but avoid the 50 moves-rule to kick in. This proces can be repeated many times for white and black. I believe there are positions where millions of iterations will be necessary to define if the position can be won or not, considering the 50 moves-rule. Manually this is impossible. Tablesbases including the 50 moves-rule are much less available than the type of tablesbases which I discussed in my blogarticle tablebases. The only website which I know having a selection of tablebases including the 50 moves-rule (or DTZ50 called) is chess.jaet.org/endings/. In the computation status you can notice that we only have a modest coverage of the existing tablebases. Of course one can ask oneself if such conflictsituations aren't very rare. In otb we may assume that nobody will be able to play 50 or more consecutive best moves like the tablebases so it is anyway something only relevant for correspondence chess or from analytical point of view. On chesspub the reference was made by Vass to a fantastic article in which 24 examples are worked out where the 50 moves-rule is important (in Russian but with googletranslate this shouldn't be a problem). 24 examples is still not much but it does indicate that a certain boarder has been crossed by iccf. Iccf chose to maximize the usage of tablebases irrespective of the 50 moves-rule. Besides we shouldn't forget that the 50 moves-rule is something arbitrary (something which i already explained in my blogarticle sportiviteit) and therefore can be considered as a tool to stop the game when the players aren't able to technically win the game. In correspondence the technique is much more refined so it is logical to disregard the 50 moves-rule and the human limitations in otb. So i understand the iccf-steps but as a theoretician I regret this evolution. To make databases exclusive for a select group, applying different rules,... hardens my task to do proper research. Also it further desintegrates the chessworld. Maybe we indeed have to specialize to protect the future but I have my doubts as often bundling the forces is a better strategy.